A friend of mine has Crohn’s Disease, which makes celiac look like a visit to Disneyland (assuming you like Disneyland). She’s on the Specific Carbohydrate Diet (SCD), which is incredibly limited. Much better than the alternative, though. Turns out, she hasn’t had ice cream for nearly a year. Possibly longer. She can’t handle the sugar or the lactose in most commercial ice creams, and she can’t handle the agave nectar in the coconut milk ice creams. She does, however, make her own yogurt. And she can have honey. So, Saturday, we got together. She with her homemade yogurt and me with my ice cream maker. And magic happened. Mix yogurt and honey together in a large bowl. Go slowly with the honey, adding it a bit at a time until you reach a sweetness you’re happy with. 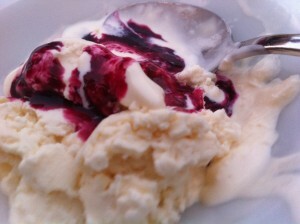 Pour into ice cream maker and run for 20 – 30 minutes. 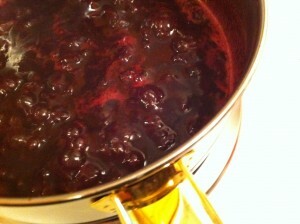 We decided to make a blueberry sauce while we waited, which turned out to be a stroke of genius. The yogurt ice cream, on its own, was quite good. I call it yogurt ice cream (and not froyo) because really, the texture is just like ice cream. Like good, dense, rich ice cream. Think Haagen Dazs levels of richness, and then some. On it’s own, it was sweet and tangy, which we both loved. But with the blueberry sauce on top of it? We both agreed, we’d choose it over chocolate — at least half the time. For those who are interested, the links below are for the SCD book and the ice cream maker we used. Wow that looks delicious, I’m looking forward to seeing how the batch we are making tonight turns out. As newbies to the Specific Carbohydrate Diet, we have been scouring the ‘net for good recipes that are SCD friendly. One of those that we found has turned out to be AWESOME. Cream yogurt. We found it at HEAL~BALANCE~LIVE. We get organic cream with as few additives as possible. Around here that is either Organic Valley (zero additives) or Umpqua (only carrageenan). We make it into yogurt as specified for the diet, 24 hours in the yogurt maker. It whips just like regular whipping cream, comes out light and fluffy, and sweetened with 1/4 cup or so of honey. I think you can add up to a half cup though we don’t need that much. Even the non-yogurt eaters in the house eat it out of the bowl and love it! That said, we decided to see if the Cream Yogurt will make a good ice cream. We’re setting up to do that today in our wonderful Cuisinart ice cream maker. Hopefully it will be wonderful too!